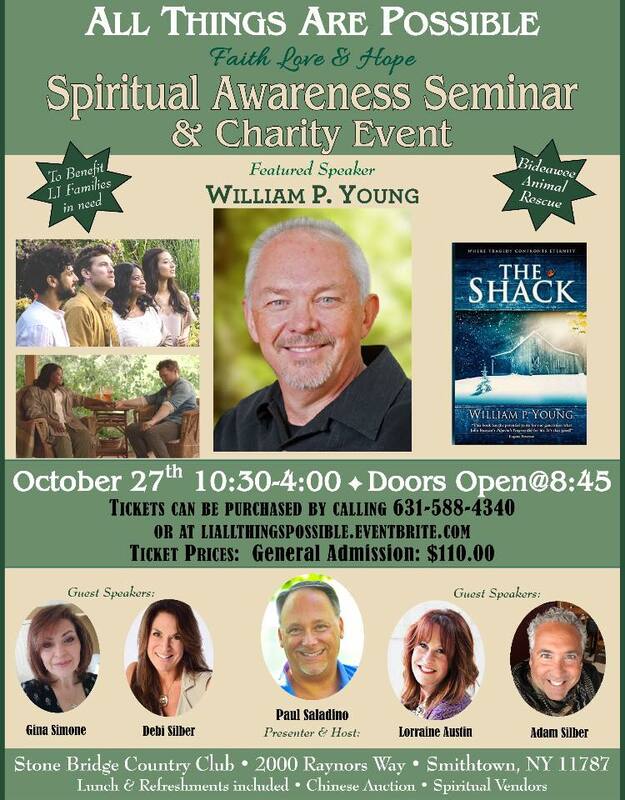 All day Spiritual Seminar with Paul Young, author of the book and movie The Shack. Lecture Speakers, vendors, raffles, snacks and a full lunch served! **Special discounted ticket pricing for my clients and website followers**. 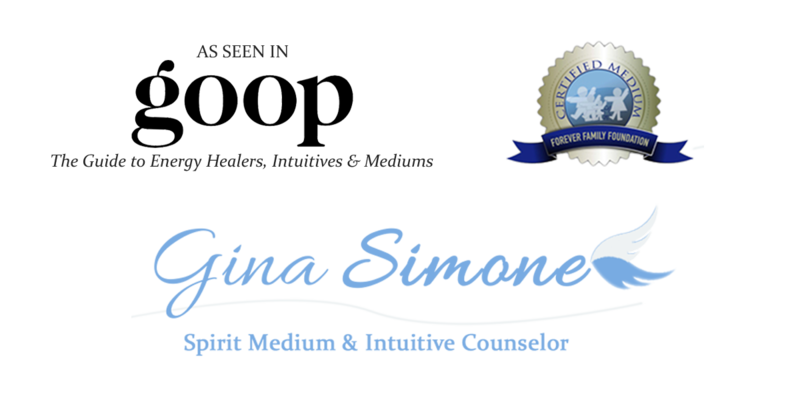 Contact me via email at GinaSimoneMedium@yahoo.com or text/call 516-446-7676 for specific discounts. Dinner & Medium Messages!! 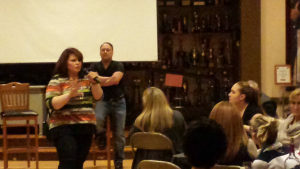 $65/pp (includes 3 course meal, tax & gratuity)) plus messages shared by Spirit for the group! Dessert and coffee are included!! * Reservations MUST be made in advance. Payment and dinner selections must be made at time of reservation. Check flyer for dinner selection choices. 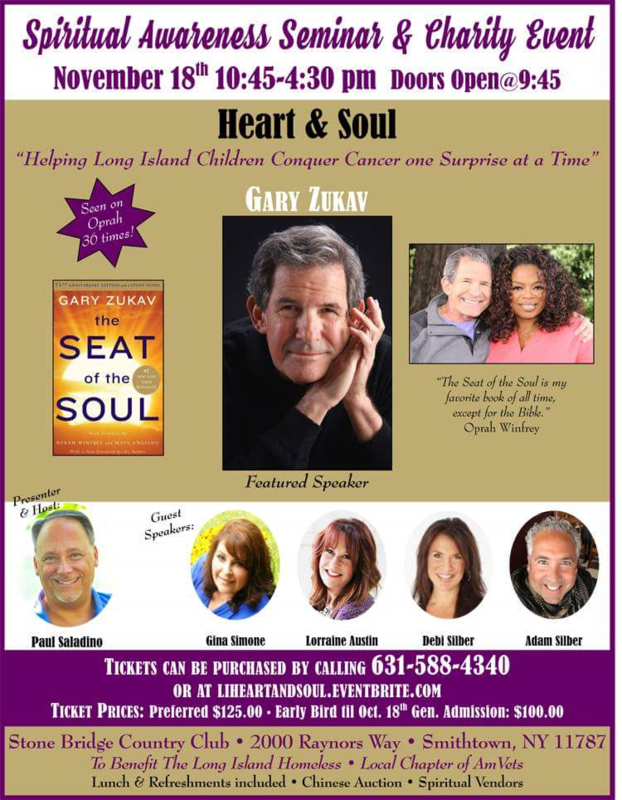 Come see some of Long Island’s top Spiritual Speakers alongside best selling Author Gary Zukav for a day of Spiritual learning, Enlightenment and Fun!! This is our 5th Annual Spiritual Seminar on Long Island, and it keeps getting better and better each year! This year we are sponsoring 5 LI children battling cancer to making their wishes fulfilled! Proceeds will also be contributed to the Long Island Homeless and AM Vets organizations. Fundraiser for the LGBT Community Organization!! Messages shared from your Loved Ones in Spirit!! Open group reading will be from 2-4pm. Space is limited. Must reserve your spot ahead of time. 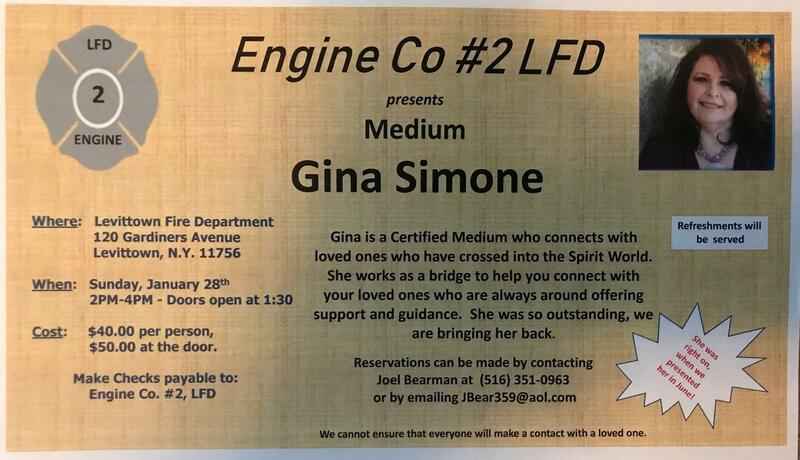 Please see below for ticket information. This event is being hosted by the Imperial Court NY, a LGBT fundraising organization which has raised millions of dollars for social service and health support organizations. Members are people who have chosen to make a commitment, get involved and make a difference in the lesbian, gay, bisexual and transgender community. Come out for an afternoon of fun, food and connecting with your Loved Ones in Spirit!!! Come join us for an open group reading benefitting “Gabriel’s Angels” , a fundraiser for Ovarian Cancer. It’ll be a night of healing & loving messages from your loved ones in Spirit!! 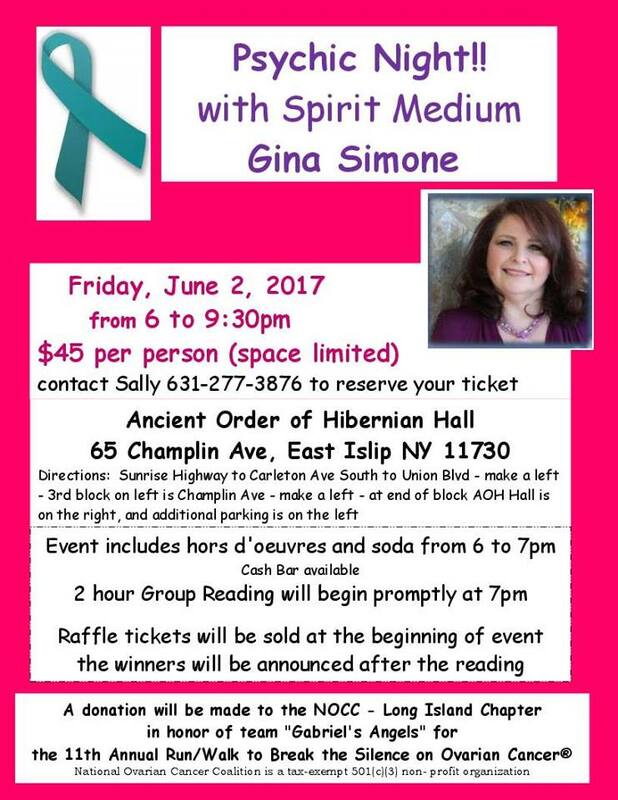 Includes hors d’oeuvres, refreshments (cash bar additional), 2 hour group reading and raffles sold at the door. 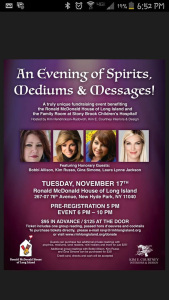 Please contact RSVP@RMHLongIsland.org for tickets. Each ticket includes ONE group reading , hors d’oeuvres & cocktails. Meet speakers, vendors, and enjoy a gallery reading to help benefit LI Cares Food Pantry and the AM Veterans. 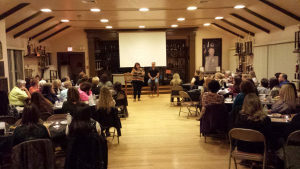 Enjoy a day of like minded speakers, while giving to LI communities in need. 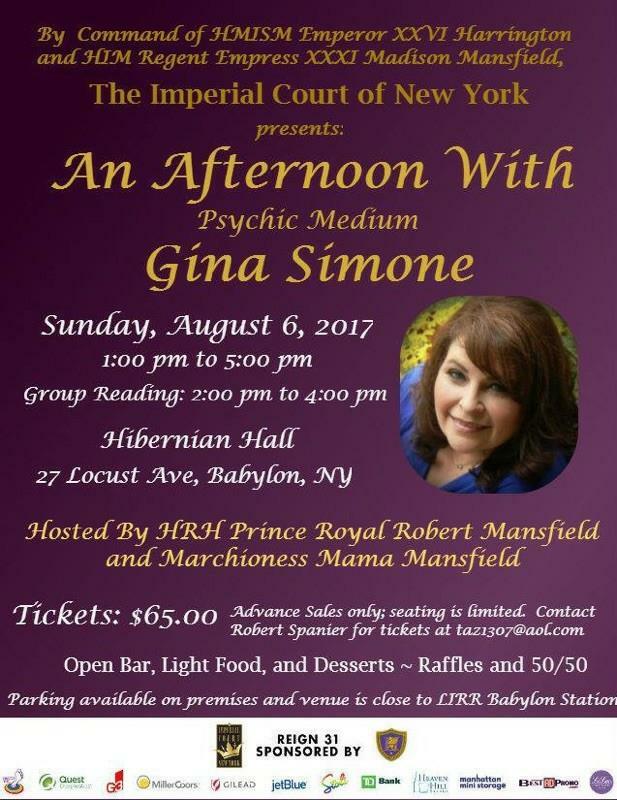 Meet 5 psychics, who will talk about Spirit and help you connect to your loved ones in Spirit. Join us at the Crest Hollow Country club for a fundraising event for LI Cancer Care. 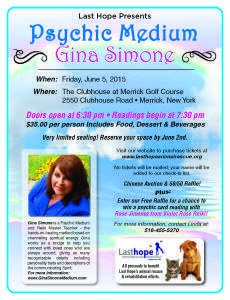 Vendors, food, giveaways and Psychic readings all to benefit cancer prevention on Long Island. $45 – Light Refreshments served. 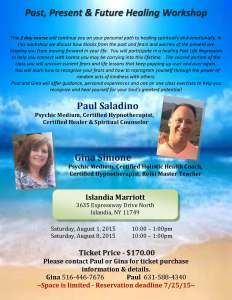 Come for a night to receive healing messages with 2 of Long Island’s Psychic Mediums, Gina Simone and Paul Saladino. 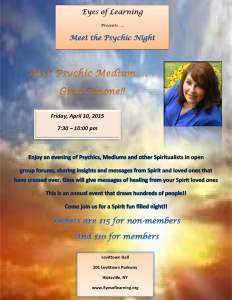 Come for messages from Spirit Loved ones! 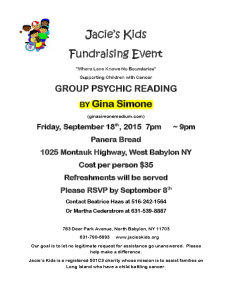 All proceeds to benefit Jacie’s Kids – an organization assisting children with Cancer and their families on Long Island. 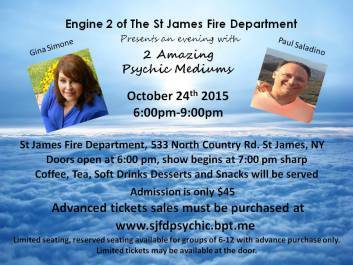 Come for open group mediumship readings. 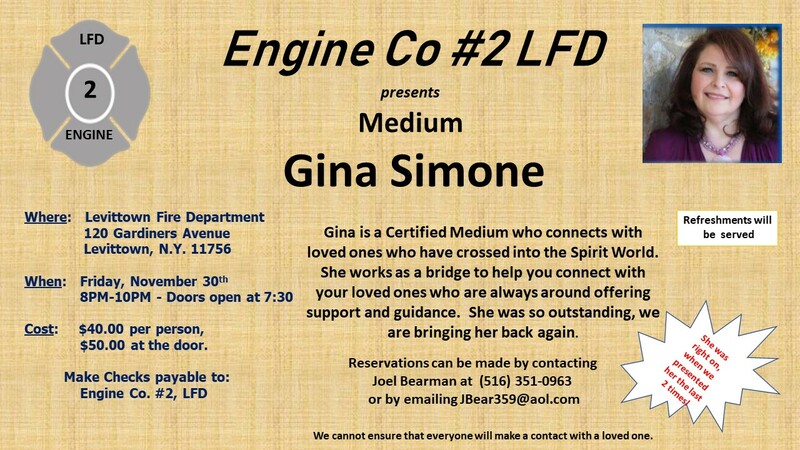 An opportunity to connect with your loved ones in Spirit in an intimate setting! This 2 day workshop we discuss how blocks from the past and fears and worries of the present are keeping you from moving forward in your life. You will participate in a healing Past Life Regression to help you connect with karma you may be carrying into this lifetime. The second portion of the class you will learn how to recognize your fears and how to reprogram yourself through the power of random acts of kindness with others. Paul and Gina will offer guidance, personal experiences and one on one class exercises to help you recognize and heal yourself for your Soul’s greatest potential! Sharing Spirit messages from your loved ones that have crossed over, waiting and wanting to let you Runyons flyer 6.1.15 revised v.2know they are still always with you!! 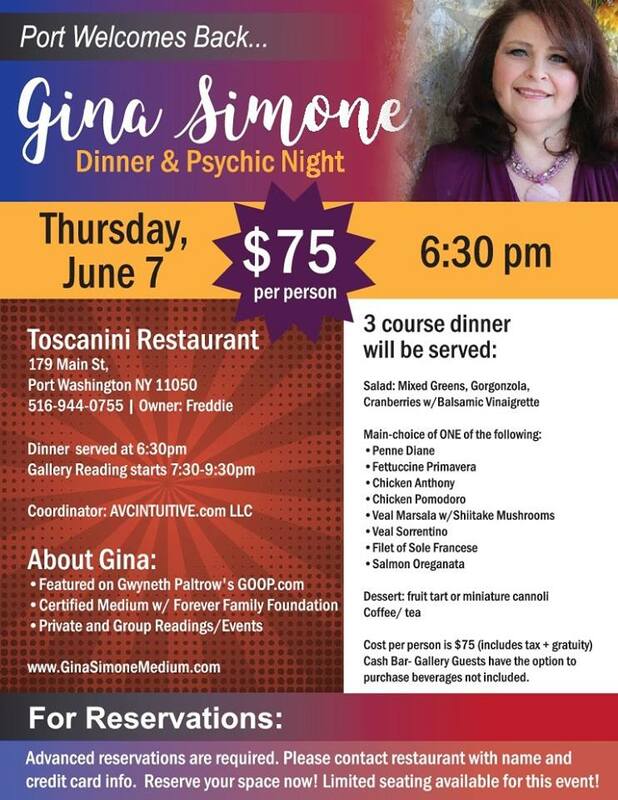 Come join us at Runyon’s Restaurant for a fabulous Buffet dinner, drinks, dessert & Coffee as well as beautiful messages shared by Spirit with Gina Simone! Space is LIMITED! 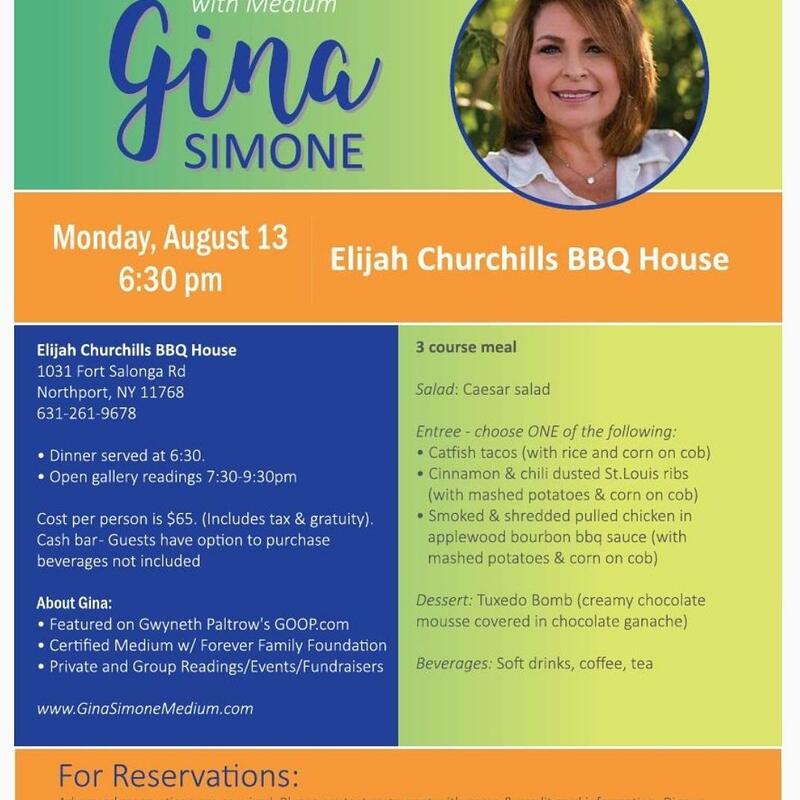 Please call to reserve your spot! This event is also benefitting BIDAWEE! Please bring donations such as dry and canned pet food, leashes, cat litter, wee-wee pads, dog/cat beds, gently used towels & blankets for our Furry friends! There will be free refreshments, snacks, coffee and raffles to win!! 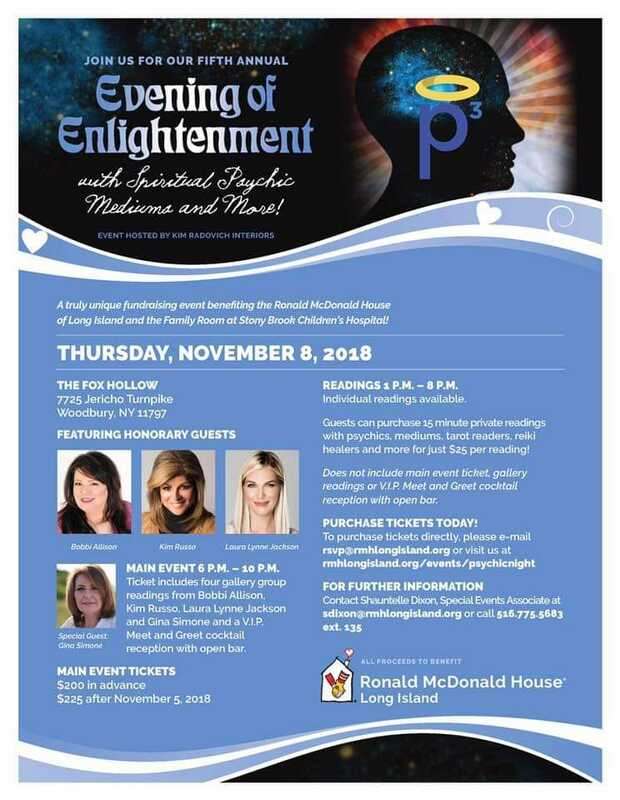 Enjoy an evening of Psychics, Mediums and other Spiritualists in open group settings, sharing insights and messages from Spirit and loved ones that have crossed over. 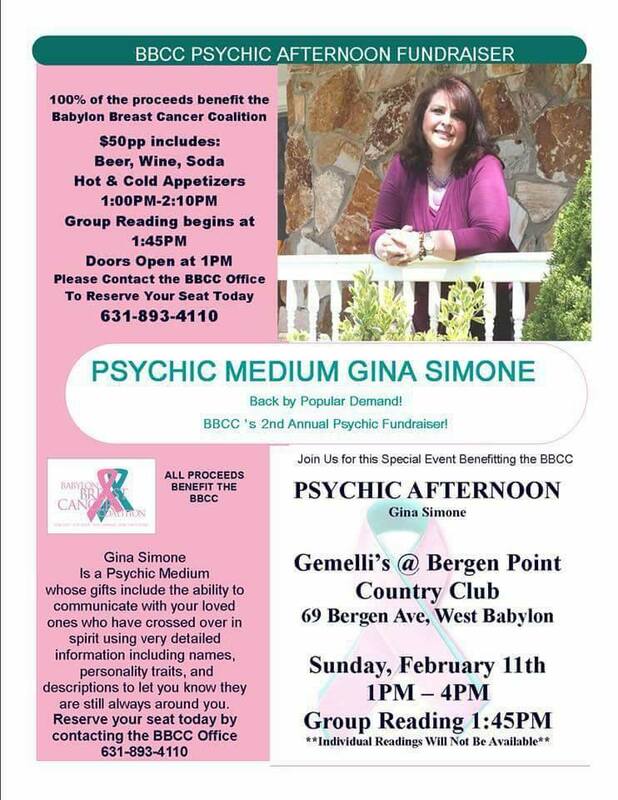 Gina Simone will share messages of Meet Psychic Medium 4.10.15healing from your Spirit Loved ones, angels and Spirit guides. Don’t miss this great opportunity to receive messages from your family in Spirit. This is a semi-annual event that draws HUNDREDS of people!! 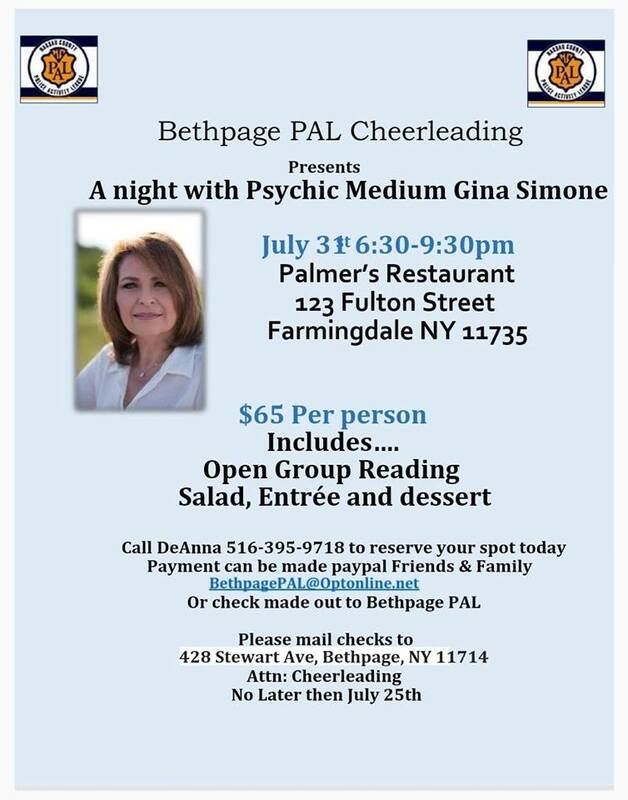 Come join us for a Spirit fun filled night!! Tickets are $15 for non-members and $10 for members. 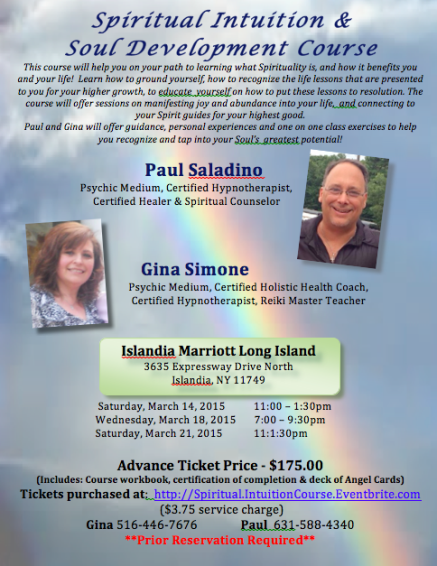 Join myself and gifted Psychic Medium Paul Saladino for a 3 day workshop on learning how to open yourself up spiritually to connect to your higher self! Learn how to ground yourself, how to recognize the life lessons that are presented to you for your higher good. The workshop will offer sessions on manifesting joy and abundance in your life and connecting to your Spirit guides for your highest learning. 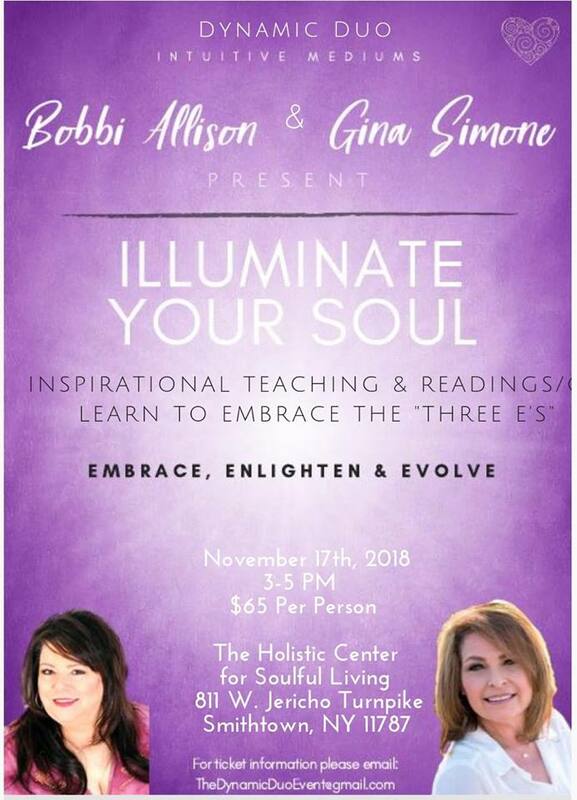 Paul & Gina will offer guidance, personal experiences, and one on one class exercises to help you recognize and tap into your Soul’s greatest potential. (all three days are required) *Please contact for further details and registration/payment instructions.